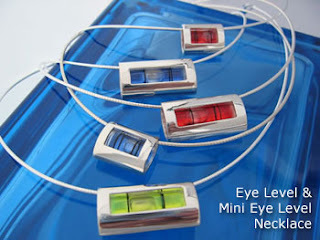 One of my all-time favorite jewelry designers is Judi Patson of Even Design. (see previous posts on monkey and lego collection). 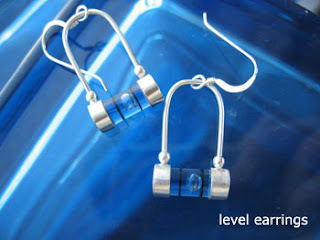 She makes the most imaginative and creative jewelry designs that somehow manage to be totally sophisticated. 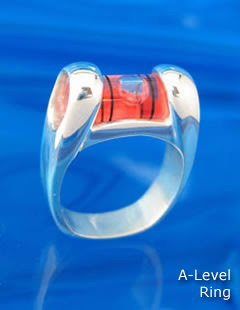 Her signature collection, and for which she has garned international attention, features levels set in sterling silver. Available in various colors and shapes, the collection features necklaces, earrings, bracelets and cuff-links that range in price from $95 to $300. This is bold balanced design at its best. Hi! Very interesting works, really cute. greetings from Buenos Aires Argentina, in the south of the world. These are really innovative. How fun to have something that moves!